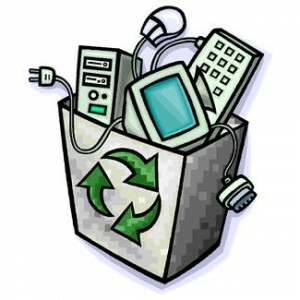 Corporate E-Waste Pickup: If your company has e-waste, or surplus computers that you need to have removed call us and schedule a corporate e-waste pickup. In many cases there is no charge to come to your Puget Sound location and remove your surplus computers, laptops, servers, printers, and other types of equipment. We will provide a certificate of data destruction and wipe the data from all machines so your staff doesn’t have to do it. If you need any surplus computers or other e-waste removed just give us a call and schedule a computer pickup. Data Wiping: All computers we pick up for recycling will have their data wiped. We also will wipe additional recycled hard drives. If your company has old hard drives and you need to get rid of them, but there is sensitive data let us know, and we can just wipe them for you when they are recycled. Many offices in Seattle do not have loading docks, or loading areas. Our team is great at logistics when it comes to picking up computers and e-waste to be recycled. We can coordinate with your staff and ready the equipment, and then swoop in (not kidding) and remove it before the neighbors complain, or other problems arise. Just call us if you have logistics problems removing recycled computers, and we can work it out. On Site Service: In some cases in the past our recycling team has been able to assist the employees of a company with computers to recycle in removing hard drives, and inventorying equipment. Many customers have asset tags that need recording, or they need the hard drives removed from their computers before they can recycle them. This is no problem. Just ask.